What Does a United States Postal Service (USPS) Worker Do? There are a good many different jobs and careers available with the United States Postal Service (USPS), from sorting and delivering mail to management positions. The Postal Service is the third largest civilian employer in the U.S., employing approximately 502,400 workers in 2016. It also operates one of the largest civilian vehicle fleets in the world. Career options include delivery and operations, including mail carriers, mail handlers, and tractor-trailer operators. 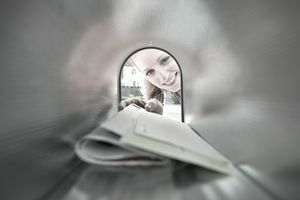 Gather mail from post office boxes, offices, and other locations. Accept incoming mail at the post office. Sort mail according to zip code and other criteria, either manually or with the help of equipment. Deliver mail, getting signatures for receipt when necessary. The USPS also has many career options in accounting, business, finance, human resources, legal, and marketing. Salaries are competitive with many private sector jobs, and when combined with the benefits the USPS offers, this is an attractive employer. Postal machine operators, processors, and sorters tend to be the most highly paid. The post office offers a variety of benefits, including dental, vision, health, and life insurance, flexible spending accounts, long-term care insurance, retirement savings plans, generous vacation time and sick leave, and many types of education assistance, including career development and training. Added together, this can be quite an attractive compensation package. The post office doesn't have any particularly stringent education requirements, and it offers a variety of training programs. Education: A high school diploma is required, and post-secondary education is encouraged. Training Programs: The Management Foundations Program is a paid, 18-month internship program for entry-level workers to gain professional experience in a variety of positions. Interns gain knowledge about the USPS through monthly training with top executives of the organization, and they rotate through various departments. Interns are offered jobs upon satisfactory completion of the program. The Postal Service also has a 10-week Summer Intern Program for current college juniors and seniors. Interns work on a particular project related to the USPS in this program. Professional Development: After you're hired, the USPS offers many other opportunities for employees to develop professionally, including a New Supervisor Program designed to help employees gain experience while learning management skills. Leadership Programs focus on different aspects and levels of management development for individuals who have demonstrated potential in the areas of management and executive leadership. You must also be at 18 years old at the time of appointment, or 16 years old if you have a high school diploma. You must be a U.S. citizen, permanent resident, or a citizen of American Samoa or another U.S. territory. You must have recent employment history—this can't be your first job—and have a safe driving record if you're applying for a carrier position. You'll have to pass a criminal background check, drug screening, and medical assessment. You must have a good command of the English language and be registered with Selective Service, if applicable. People skills: You'll be dealing extensively with the public in either a carrier or clerk position, so you must be friendly, polite, and patient. Physical fitness: Mail carriers are required to walk a great deal, and sometimes across considerable distances. They must also carry heavy parcels, so this job requires strength and stamina. Unfortunately, the job outlook for postal workers—both clerks and carriers—is not good. The U.S. Bureau of Labor Statistics expects that job growth will drop by about 13% in the decade from 2016 through 2026, due primarily to the fact that Americans are relying more on electronic mail and automated bill paying and less on "snail mail" services. Mail carriers spend their days largely outdoors, either on foot or in USPS vans and trucks. They don't get a break when inclement weather hits. You'll remember this saying, memorialized over the doorway of a post office in New York: Neither snow nor rain nor heat nor gloom of night stays these couriers from the swift completion of their appointed rounds. This can mean dealing with dangerous roadways and footing. Clerks fare much better. They work indoors, in the post offices. This is a full-time position. USPS offices are open six days a week, so the job can require working on Saturdays, and sometimes on Sundays even when post offices are closed. This is particularly the case prior to holidays when shipping and mailing is at a peak. USPS employment information and career opportunities are available in the Careers section of the USPS website. Search by keyword, location, and area of employment. You can apply online, but you must first create an online eCareer Profile on the website. You'll need a valid email address to create your profile and to apply for jobs. You can download your resume to include with your application. The USPS works to provide career opportunities to military veterans, reservists, and their family members. Interested applicants can note their veteran’s preference on their online job application. The USPS is an attractive employer for military families who often have the need to move frequently to stay together because of the number of its locations nationwide.